For schedule updates, visit www.pvcc.edu/classes. PVCC Fall 2014 Class Schedule 3 Scan with your smartphone. 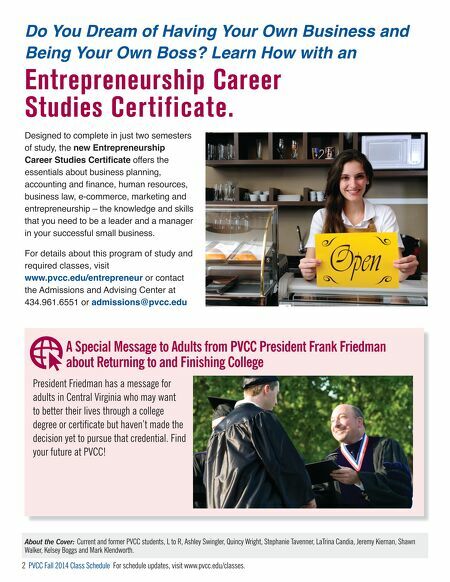 Many Piedmont Virginia Community College alumni and students tell us that they find their future at PVCC. They find a quality education and caring faculty and staff that prepare them for a fulfilling career. They discover the inner satisfaction of gaining knowledge and cultivating newfound strengths and capacities. And in the process, they save thousands of dollars in tuition and fees compared to four-year schools. We invite you to do the same. I Doing What She Loves t's not unusual to find a person who really likes chocolate, but PVCC culinary arts student Alex Hollis takes her passion for it to a whole new level. "I've always loved chocolate – the smell, the taste, the way it melts. Chocolate makes people smile, and sometimes I'll give it to my friends just to make their day." She said that her interest in the confection intensified when she was at the grocery store with her mother one day and saw some of the large bricks of chocolate that professionals use. She bought a block and some molds, and her first batch of homemade gourmet chocolates was born. Getting Serious At The Covenant School, she found even further inspiration. "I had a teacher who taught us about fair trade products, like coffee and bananas – things that come mostly from South America and the Ivory Coast of Africa. I did a project on fair trade cocoa and learned the importance of our food sources and the ethics behind them." Alex said she had found her PVCC Student: Alex Hollis A Palate-Pleasing Path toward a Culinary Career Alex Hollis calling. "I knew I wanted to go to a culinary school out of high school, but they can be really expensive. My mom and I were hoping that PVCC would offer a program so I could start there. I graduated from high school in May 2013, and PVCC launched their culinary program later that fall. It worked out perfectly!" Learning from the Pros Alex said that she truly enjoys Videos, Slideshows, Podcasts and More in PVCC's Award Winning Digital Class Schedule! Look for this symbol throughout this digital publication for interactive content. View it on your computer, tablet or smartphone. Our digital credit class schedules have won national and regional awards from the National Council for Marketing and Public Relations (NCMPR).